This is a honeycomb world. It hides a hollow heart. 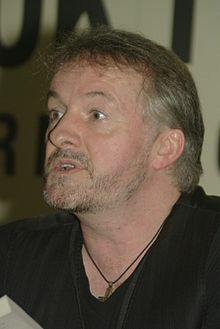 John Connolly (born 31 May 1968) is an Irish writer. His best known thrillers present as a main and recurrent character the detective Charlie "Bird" Parker. As a journalist, he has written for The Irish Times. The truth of nature, wrote the philosopher Democritus, lies in deep mines and caves. The stability of what is seen and felt beneath our feet is an illusion, for this life is not as it seems. Below the surface, there are cracks and fissures and pockets of stale, trapped air; stalagmites and helactites and unmapped dark rivers that flow ever downward. It is a place of caverns and stone waterfalls, a labyrinth of crystal tumors and frozen columns where history becomes future, then becomes now. For in total blackness, time has no meaning. They are coming in their trucks and their cars, plumes of blue smoke following them through the clear night air like stains upon the soul. They are coming with their wives and their children, with their lovers and their sweethearts, talking of crops and animals and journeys they will make; of church bells and Sunday schools; of wedding dresses and the names of children yet unborn; of who said this and who said that, things small and great, the lifeblood of a thousand small towns no different from their own. They are coming with food and drink, and the smell of fried chicken and fresh-baked pies makes their mouths water. They are coming with dirt beneath their nails and beer on their breath. They are coming in pressed shirts and patterned dresses, hair combed and hair wild. They are coming with joy in their hearts and vengeance on their minds and excitement curling like a snake in the hollow of their bellies. They are coming to see the burning man. And as they descended, tumbling through the void, they were cursed as the newly blind are cursed, for just as the darkness is more terrible for those who have known the light, so the absence of grace is felt more acutely by those who once dwelt in its warmth. They screamed in their torment, and their burning brought brightness to the shadows for the first time. The lowest of them cowered in the depths, and there they created their own world in which to dwell. This world is full of broken things. Broken hearts, broken promises, broken men, broken people. This world, too, is a fragile construct, a honeycomb place where the past leaches into the present, where the weight of blood guilt and old sins causes lives to collapse and forces children to lie with the remains of their fathers in the tangled ruins of the aftermath. I am broken, and I have broken in return. Now I wonder how much hurt can be visited upon others before the universe takes action, before some outside force decides that enough has been endured. I once thought that it was a question of balance, but I no longer believe that. I think that what I have done was out of all proportion to what was done to me, but that is the nature of the revenge. It escalates. It cannot be controlled. One hurt invites another, on and on until the original injury is all but forgotten in the chaos of what follows. I was a revenger once. I will be one no more. But this world is full of broken things. Sometimes, Louis dreams of the Burning Man. He comes to him when the night is at its deepest, when even the sounds of the city have faded, descending from symphonic crescendo to muted nocturne. Louis is not even sure if he is truly asleep when the Burning Man makes his presence felt, for it seems to him that he wakes to the sound of his partner's slow breathing in the bed beside him, a smell in his nostrils that is both familiar yet alien: it is the stink of charred meats allowed to rot, of human fats sizzling in an open flame. If it is a dream, then it is a waking dream, one that occurs in the netherworld between consciousness and absence. Louis, the killer, the burning man. Louis, the last of the Reapers. I tell myself that this is not an investigation. It is for others to be investigated, but not for my family, and not for me. I will delve into the lives of others, and I will expose their secrets and their lies, sometimes for money, and sometimes because that is the only way to lay old ghosts to rest, but I will not begin to pick and scratch at what I have believed of my mother. They are gone. Let them sleep. But there are too many questions left unanswered, too many inconsistencies in the narrative constructed of their lives, a tale told by them and continued by others. I can no longer allow them to remain unexamined. I replaced her glass with a clean one, and filled it with the best California we had in the house. "Will you join me?" she said, and when she spoke those words they seemed to promise, at some point in the future, more than a drink in a dimly lit bar. "Sure," I said. "It would be a pleasure". It was Dr. Al-Daini who found the girl, abandoned and alone in the long central corridor. She was almost entirely buried beneath broken glass and shards of pottery, under discarded clothing, and pieces of furniture, and old newspapers used as packing materials. She should have been rendered almost invisible amid the dust and the darkness, but Dr. Al-Daini had spent decades searching for girls such as she, and he picked her out where others might simply have passed over her. In the darkness of a Virginia prison cell, he stirs like an old demon goaded by memories of its lost humanity. The dream presses upon him once more, the First Dream, for in it lies his beginning, and his end. Once upon a time—for that is how all stories should begin—there was a boy who lost his mother. He had, in truth, been losing her for a very long time. The disease that was killing her was a creeping, cowardly thing, a sickness that ate away at her from the inside, slowly consuming the light within, so that her eyes grew a little less bright with each passing day and her skin a little more pale. In the beginning, about 13.7 billion years ago, to be resonably precise, there was a very, very small dot. The dot, which was hot and incredibly heavy, contained everything that was, and everything that ever would be, all crammed into the tiniest area possible. The dot, which was under enormous pressure due to alla that it contained, exploded, and it duly scattered everything that was, or would be, across what was now about to become the Universe. Scientists call this the "Big Bang", although it wasn't really a big bang at all because it happened everywhere, and all at once. The Multiverse was unfathomably huge, thought Nurd, but it was still small enough to allow two strangers like Samuel and himself to find each other and become friends. This page was last edited on 6 October 2018, at 04:20.